What is one of the things I like about Stampin'Up? That most everything coordinates. Here is a pic of some projects I created with this wonderful suite. I used the new DSP Floral District, the new stamp set Betsy's Blossoms, the new Betsy's blooms wheel, my favorite Curly Cute sentiment stamp, the beautiful Elegant Bird die and Fun flowers die. I hope you get inspired. 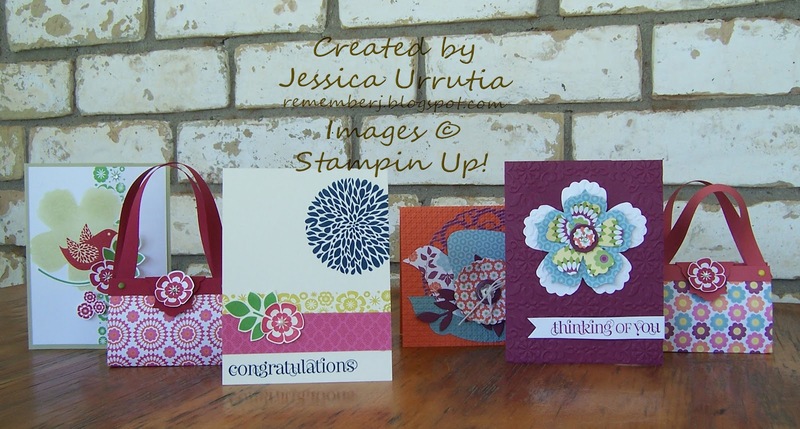 Leave me your love with your comments and go take a look at our new 2012-2013 Stampin' Up catalog. Is simply beautiful. I will post individual pictures with instructions in a few days. What an adorable suite of projects! I love them! Can't wait to read about details for each! Thank you so much Annie, a little late but at last posting again. Blessings and tx for your comments! !